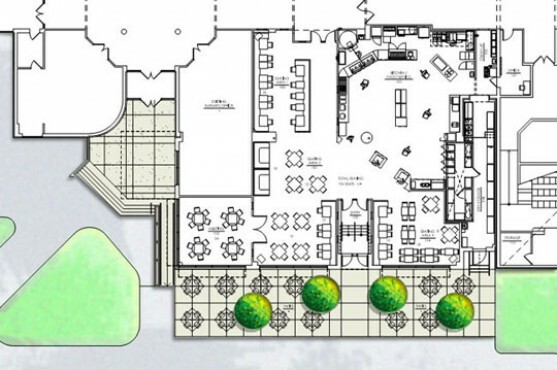 The expansion and renovation of the student center's dining facility. Objectives included complete replacement and expansion of the kitchen and servery, and creation of a new dining space. The building's footprint was expanded with a single story addition that utilized the foundations of the former dining patio. The new facade has a direct south exposure on the campus quad. The competing desire for natural light and views versus solar heat and glare were addressed with high performance windows and the use of solar shading devices. The corner meeting/dining room is expressed by the use of a floor to ceiling glazing system.